Earlier we put out a call for scholarships after a challenge by Eddie Caven of Key Date Coins to dedicate one lot for the cause. (It brought $175!) We have learned that Weaver Coin Auction, our top-rated house, also donated to our fund. Thank you Dave and Cheryl! Auction houses are usually run by families (and often take an extended family to run). So we know how much you care about education. Some of you have even shared pictures of your family and children in personal correspondence. So we also know you realize the rising costs of a college education. Students across the nation are being saddled with lifelong debt, which will inhibit their purchasing power in the future, and that can affect your business. Factor this: The typical collector or estate sale buyer is highly educated with a median household income of $164,000 and usually spends $5,990 in a typical year. Don’t count on recent grads to meet those demographics in the future unless all of us do something about student debt now. As for us, we operate Proxiblog without taking advertising and provide it free of charge in our off hours. We now have 9225 views in the United States, Canada and Great Britain and share without cost a Kindle-sized book about online auctioneering replete with dozens of numismatic photos. We dedicate time to showcase best practices and acknowledge those who exceed or meet our standards in both our “TOP Awards” and Honor Rolls. We also share expertise when asked without charging fees and play a role in changing Proxibid policy when it affects the auctioneering business, as this post illustrates. Won’t you help support our scholarship cause as the Weavers and Eddie Caven have done as well as other donors (thank you, Jim and Sue!) by clicking the picture on the top of our new rankings in the right sidebar and giving what you can afford to help students at Iowa State? Your donation will be used for First Amendment scholarships. After all, auctioneers are known for calling things as they see them–literally. 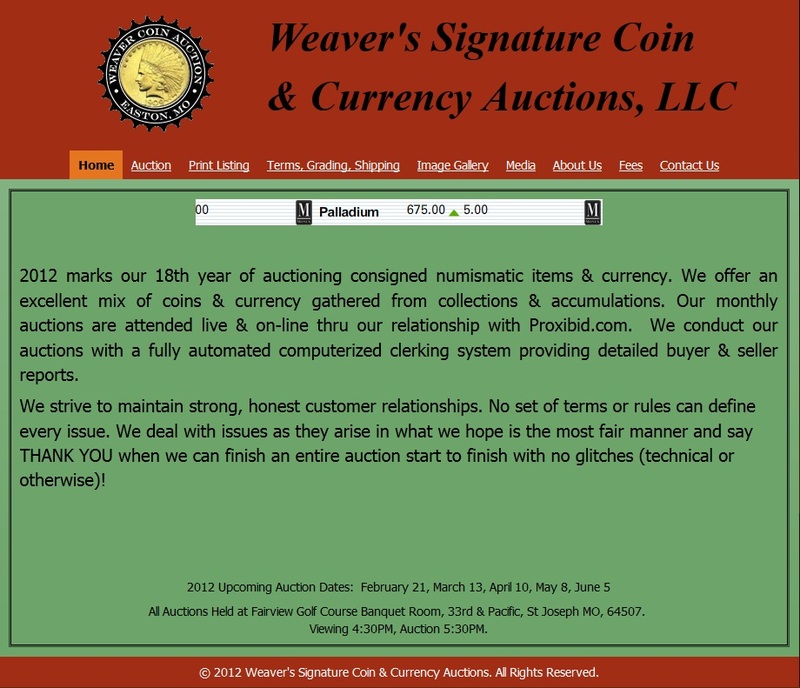 This entry was posted in News and tagged American Numismatic Association, Auctioneers, AuctionZip, Best Practices, Cheryl Weaver, Coin Auction, Dave Weaver, Key Date Coin Auctions, National Auctioneer Association, Proxibid, Proxiblog, Weaver Signature Coin Auction. Bookmark the permalink.